The Cotswolds, with its enchanting villages and traditions, provides many gardening highlights. The region boasts some of the most beautiful gardens in England and the UK. The Cotswold Hills rise gently west from the broad, green meadows of the upper Thames to crest in a dramatic escarpment above the Severn valley and Evesham Vale. Rural England at its most mellow, the landscape draws a unique warmth and richness from the famous stone beauty of its buildings. 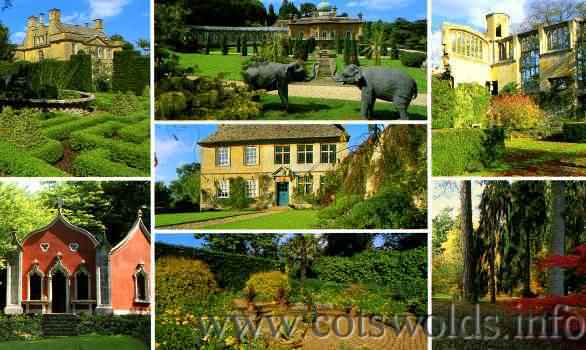 Treat your senses to the truly fantastic array of sights and smells around the many Cotswold gardens, from grand designs attached to stately homes to the secret delights and private passions of many individuals' more modest homes. Many stately homes and gardens open their gates from the first show of snowdrops to the last leaf of autumn and are a delight to visit. The Cotswolds are nationally important for their rare limestone grassland habitat and for ancient beechwoods with rich flora. Important grasslands such as Cleeve Hill have survived due to their status as ancient common and a National Nature Reserve protects the finest ancient beech complex. Some Cotswolds plants are so rare that they have specific legal protection under the Wildlife and Countryside Act 1981. Traditionally a landscape formed by sheep grazing, this is now prosperous mixed and arable farming country. The Area of Outstanding Natural Beauty excludes urban areas but includes market towns such as Chipping Campden and beautiful villages like Broadway. Now only the third largest employer, agriculture is outranked by tourism and services. Of the working residents (population about 120,000), 73 per cent commute beyond the AONB to Cheltenham, Bath, Gloucester, Cirencester and elsewhere. The Cotswolds provide splendid landscape scenes, trickling streams, dry stone walls and grazing sheep and will delight as you explore the regions garden treasures. The dry stone walls and limestone cottages covered with spring Clematis and Wisterias are stunning features of the quaint stone villages and on the borders, in the Vale of Evesham a stupendous mass of fruit blossom in April and May from Apple, Plum and Pear. In June and July the Hollyhock growing like weeds out of any crevice in footpaths to full summer and late Autumn of cottages drenched in climbing roses. The rolling hills, steep escarpments and wooded coombs of the Cotswolds are blessed with a temperate climate and a tradition of prosperity that has allowed its inhabitants to build splendid manors and fine houses out of the local honey-coloured limestone. To complement such dwellings magnificent gardens were constructed, designed by famous figures such as Capability Brown, William Kent and Sir Geoffrey Jellicoe.